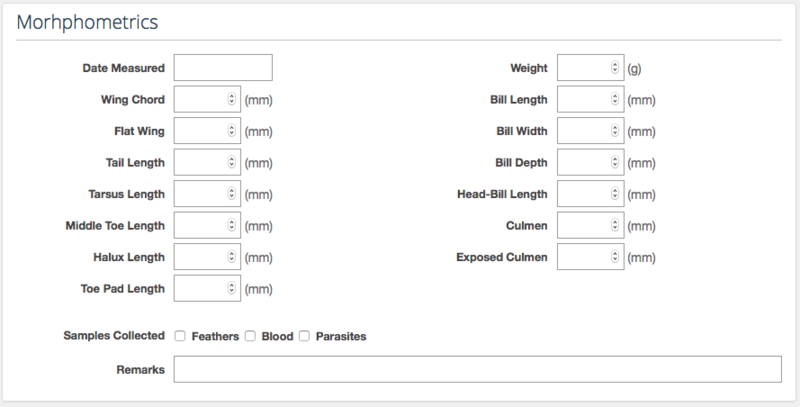 We’ve just released a new extension for Banding & Morphometrics data to be recorded in WRMD. 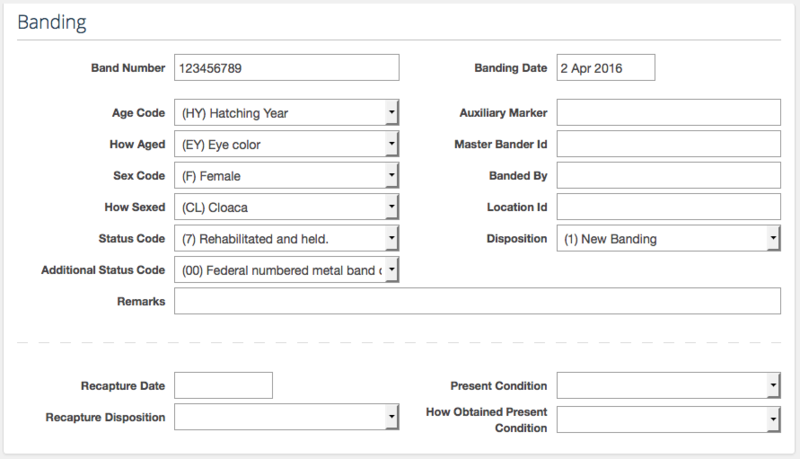 The data fields are compatible with the USGS North American Bird Banding Program – Bird Banding Laboratory and Bandit 4.0. There are two panels on the Banding & Morphometrics page; one for banding and the other for morphometrics. 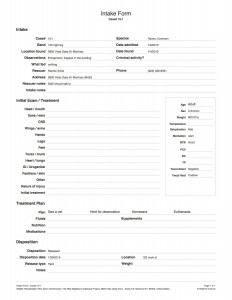 In the banding panel you can record all the required fields for for the North American Bird Banding Program as well as a few others that are common for wildlife rehabilitators. 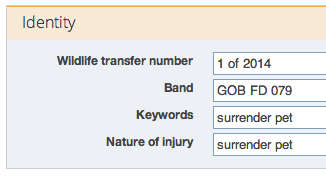 You can also include recapture data if the bird you are treating already has a BBL band. 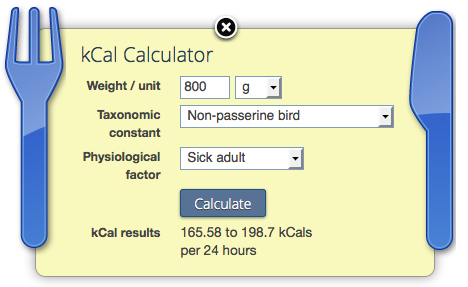 In the morphometrics panel you can record all the most common measurements of specific parts and the weights for your bird patients. You can also indicate what samples (if any) were collected at the time of taking the measurements. This extension was built with the help and feedback of many of our users but we especially wanted to thank Save our Shearwater’s of Kauai, Hawaii Wildlife Center, and the Teton Raptor Center in Wyoming. We love your feedback so if you have anything to share, please do! One of the neat extensions that we have created in WRMD is “WRMD Import”. If your facility has digital records from past years, you can import these records into the current system. In order to do this, the information has to meet certain standards. Basically, it has to match what the terms and formatting are, in WRMD. Since “WRMD Import” is an extension it first has to be activated in order to use it. Once activated it will show up on the far left under “Extension Settings” as “WRMD Import”. When you click on this it will take you to a page that is full of information. Importing is a relatively easy process itself, but cleaning up the data is tedious, that is the reason for all of the instructional material. There are certain fields that you can import and certain ones that you can not. To start with, importing just the required information is a really good start for most past year records. Case Number: A unique incrementing integer that is assigned to each case. Case Year: The 4 digit year (ex: 2015) that the animal was admitted to your clinic. Disposition: The final or current disposition of the animal chosen from the available disposition options. Species: The common species name of the animal, matching a known species in Wildlife Rehabilitation MD. You can find this list here. Date admitted: The date the animal was admitted to your clinic in YYYY-MM-DD format. So, ideally what you have is an excel type spread sheet with this information on it. As you see from this list some of these require very specific formatting. This is required, because the database has to recognize the information for what it is. To view a list of the other accepted values, you must be signed in and have the “WRMD Import” activated. Once it is activated you can view that information here. Hopefully, once you have your data prepared, you then need to move it into a .CSV (comma separated values) delimited file. Once that is accomplished you can follow the basic steps for import. Validating your data will be the hardest part. If one thing is off and the database doesn’t recognize something you have to change that info on your file and then start all over again with a new CSV file. It can be a long tedious process, but if you can spend the time to get all your information correct to begin with, it will make the import process much easier and smoother. This months extension of the month were going to talk about Paper Forms. Paper forms are a great way to use both WRMD as well as paper records to help you transition from a more familiar way of keep records into a more advanced way. Ideally you would record as much as possible in WRMD but we understand that the transition for your organization can be overwhelming, so we’ve created Paper Forms to help. These paper forms are a helpful way to transition from a paper record keeping system into Wildlife Rehabilitation MD. There is a form for the Initial Care screen (Intake form) and Continued Care screen (Treatment log) that are the same format as the database. 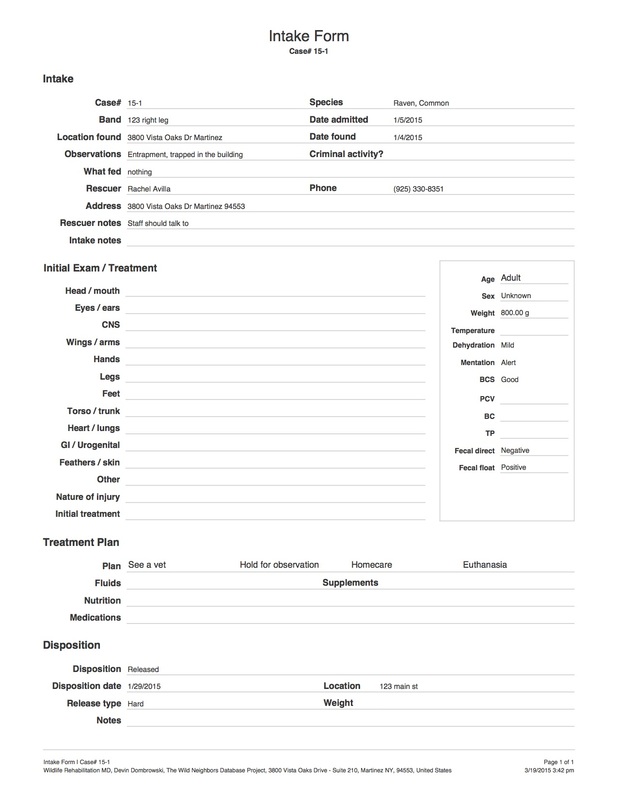 There is also a Admit form for your rescuers to fill out when admitting a new patient as well as a Cage Card for your patients enclosures. When the Paper Forms extension is activated you will have two printing options for each form. The first option is to go to the Reports link on the left sidebar. Under the Forms field there is an option for Intake form and Treatment log. Both of these forms have no additional information on them and can be used for any animal. The second option is to print these after information about a patient has already been entered into Wildlife Rehabilitation MD. To do this, on the top left of the Initial Care screen and Continued Care screen there is an option to select Intake form or Treatment log. If one of these is selected the information already in the database for that patient will print out on the form. Don’t forget, one of our goals as environmentalist should be to minimize paper use. Ideally you can switch from recording your data on paper to digital as possible. There are 4 unique calculators for your convenience. The first calculator is a standard calculator for normal day-to-day calculations. 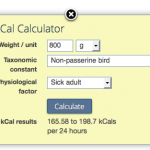 Second is a kCAL calculator that uses the IWRC kCAl equation. 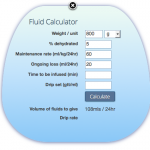 Third is a fluid calculator that has some advanced fluid calculation abilities. 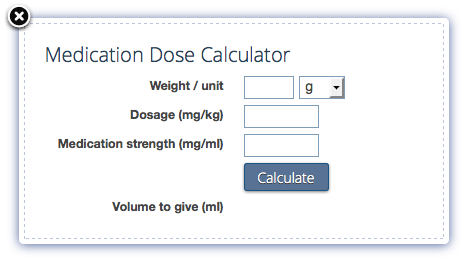 Fourth is a very simplified medication dosage calculator. 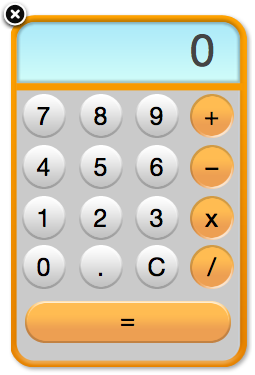 When the Calculator extension is activated all 4 calculators can be found in the left sidebar, under the quick links. 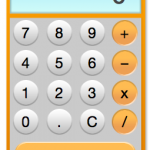 Click on the calculator icon of your choice and the actual calculator will appear on the screen. 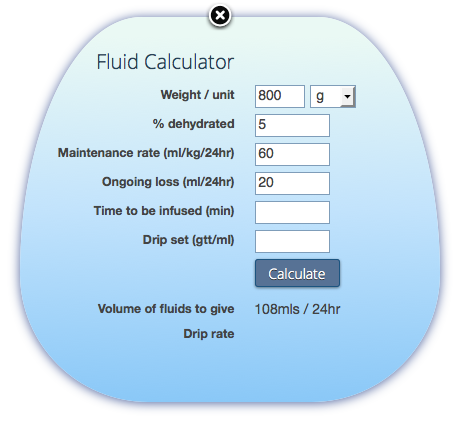 First fill in the appropriate fields, then click the calculate button and wallah, your answer is displayed. This extension may be the most simple of them all but it’s also one of the most convenient. Sidebar Shortcuts adds a few helpful links to the left sidebar under Quick Links. The idea behind the links is that you can get useful information in just one click. Print this record will print the current record being viewed. The record will not include any of the rescuers contact information or any other extensions information. If this information is needed then go to Share Record and choose the additional info to include in the printed record. Directions to address found is a link to Google Maps with pre-filed in directions from your accounts address to the address found for the current record being viewed. If you think of any other simple and convenient shortcut links lets know! One of the hardest requests we receive has been about custom fields. We can’t create a field for all the different types of information that centers record. We can only extensively generalize what most rehabilitation facilities will need. This is why Custom Fields was created. Sometimes there is something that you have to record regularly and it is a necessity. 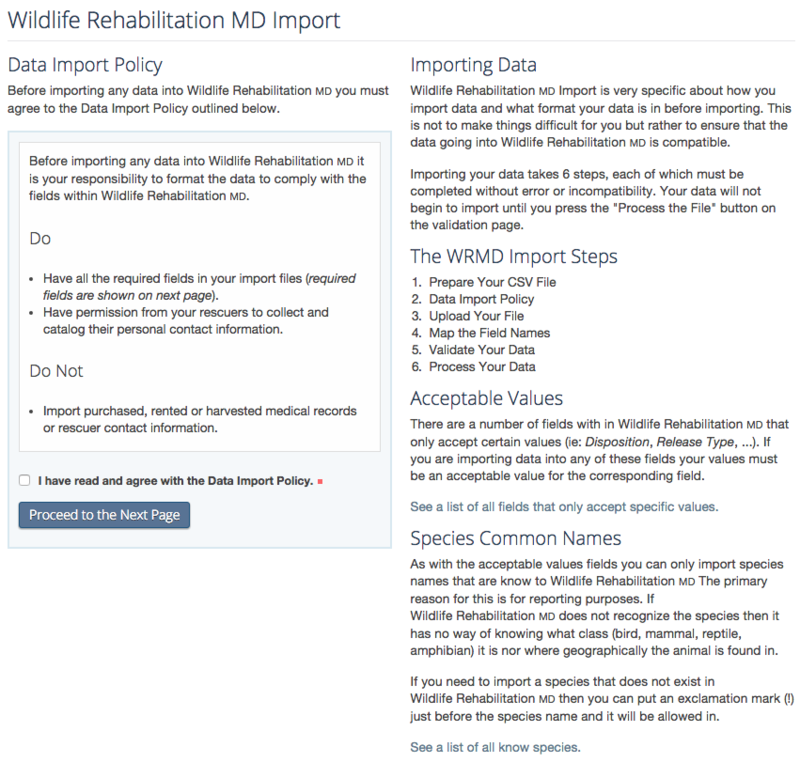 Custom fields are used when you have something that you would like to record, but Wildlife Rehabilitation MD does not offer the appropriate field. You can add in your own custom field at the top or the bottom of any box. For example, if you have a special identification number that your local Animal Services department uses and you need to record that number you could use Custom Fields to add a input field to the top or bottom of the Identity box called “Animal Services ID#”. Before using the Custom Fields extension, keep in mind that creating a custom field just for the simplicity of creating one may not be the best solution for your needs. If you plan to use your custom field on a regular basis then clearly it was a good and useful decision to add it in. However we strongly encourage you to use the fields available in Wildlife Rehabilitation MD. 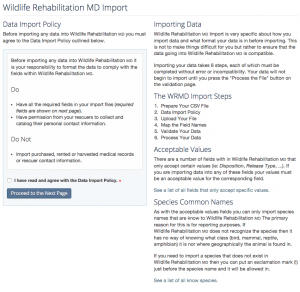 By doing so, your data is following the same standards as other Wildlife Rehabilitation MD accounts and will ensure consistency of data collected on each patient. If there is data that you need to record but no appropriate field exists, we suggest that you keep that data in the “continued treatment” field. When the Custom fields extension is activated, a settings link will appear on the left sidebar within the settings section. Select Manage Custom Fields. Choose the tab for the box that you wish to add a field into. Using the “Animal Services ID#” example above, you would select Identity. Then select Add Identity Field. The location of the new field will either be on the top or bottom of the existing native fields. You can not add a field in between existing fields. Fill in the field label and choose the field type. Short text field A short text field that allows any type of value. Long text field A long text field that allows any type of value. Date field A text field that only allows dates as values. Number field A text field that only allows numbers as values. Select list A drop down pick list of options you specify. If you choose a select list then must add the options for that list in the Options field. Lastly specify any validation rules that you want to apply to your new field. For example you could make the new field required. If you need to edit or delete a custom field, click on the circle arrow icon to edit it or the trash can icon to delete it. The Prescriptions extension is the very first extension we created and one of the most valuable, long term. Every veterinarian and every rehabilitator has their own prescriptions they give to wildlife and it is hard to know what is right and what is not. If our community can correctly record medications and the overall effectiveness of these prescriptions, we may finally have solid evidence of what seems to work and what obviously does not work. Please consider using this extension. Prescriptions is a very important extension. Ideally this one should be activated at all times. Any animal on medications should have their prescriptions recorded in this extension. This is great information to be collected so that later you can do simple research to see how well medications worked or didn’t work. You may get in a unique case and use certain drugs that work successfully. Years later, you may see a similar case and want to know what worked last time. It also can help you keep track of the entire medication history of the animal. When the Prescription extension is activated it will show up as one of the main tabs on top of the screen. This extension records the dose, the actual prescription, start date, end date and if the medication is a controlled substance. 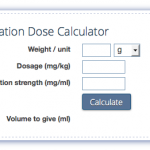 Frequency, dosage and route should be recorded within the Prescription field. To fill in a prescription first click on the arrow icon. A box will pop up with a form to fill in your prescription. Once completed click submit. If you need to edit or delete the entry, click on the circle arrow icon to edit it or the trash can icon to delete it. Preferably write your prescriptions similar to this format “Meloxicam 1.5mg/ml PO BID (0.5mg/kg)” If you do, then the prescription has a better chance of being printed properly. Prescriptions can be printed by clicking the checkbox to the left of the prescription and then clicking the printer icon above the checkboxes. There are two prescription reports available on the Reports page. One reports the Prescriptions due today and the other is a Controlled substance log of all prescriptions that use a controlled substance. The Autocomplete extension can be a very useful extension to the Prescription field if you use the same prescriptions many times. I do not think that most people understand what we mean by autocomplete and how valuable this extension can be. Not only will this extension save you valuable time and grief from misspellings but also allows for better data entry for later searches. Autocomplete enables users to quickly find and select from a pre-populated list of values as they type, leveraging searching and filtering. Autocomplete can be added on to almost any text input field. It should be used in a field where the same content is often entered. For example, in the keywords field on the initial care page you might enter in “cat caught” frequently. To simplify entering in this information you could designate keywords as an autocomplete field add give it the value “cat caught”. You could also designate other keywords such as “dog caught, hit window, hit by car, poison, etc…” Then, the next time you start typing in the keywords field, a list of potential keywords matching your text will drop down. Some other popular common fields to use this extension for are the rescuer city, city found, prescription, enclosure and nature of injury. When the Autocomplete extension is activated it will appear on the far left sidebar. Select Autocomplete settings. To add a new autocomplete, first select the input field you want, then write in a comma separated list of values you want to be used for that autocomplete. If you want the user to be able to select more than one value, choose Yes for “Multiple values?” then hit “Update autocomplete settings” to save. By default only one value can be used when typing in a field, however you can allow fields to use multiple values by select that setting in the autocomplete settings. An animal only is found in one city but could have hit a window and be cat caught. The Attachment extension is a wonderful way to attach photos or pdf documents to your records. When an animal first comes in to your center you can get a good photo of it and then again in the middle of rehab and then a release shot. You can also use these for Facebook or other publications without having to search through a million photos to figure out who is who. I will use my phone frequently, email the photo to myself and then just drag it to the attachments screen. Depending on your phone, you may also be able to upload the picture directly from the camera. If you send lab work off to a professional laboratory or have necropsies done out of house you may get the results back in a pdf. Those reports can also be attached to the record. Keep in mind there are areas to record all this information into the system itself and you will have better access to that data if you do that as well. Attachments are a great way to record nasty wounds and their healing process. Even better is the ability to attach x-rays/radiographs even if it is just a photo of one. I highly suggest using the attachment section, it is quick, easy and very handy. When you select the Attachments tab you can add attachments by either dragging your files from your computer to the Wildlife Rehabilitation MD screen or by browsing for your files by clicking “Choose a file”. There is a size requirement so you may have to reduce the size of the image before adding it to the database. Depending on the size of your files, the upload time should be only a few seconds. Once your files are uploaded, you can hover over a file to see information about that file. If you want to add or update the information about an attachment click on the circle arrow icon or the attachment. You will be taken to a screen where you can update the attachment’s name and date as well as enter the source of the attachment and a description. If you need delete the file, click the trash can icon. This month our extension of the month is a br and new extension, Volunteer Manager. In short, this extension is designed to give you quick access to your volunteers contact information. Most importantly when you create a homecare record, you can select the name of the volunteer the patient is going to, and the volunteers contact information will automatically be inserted into the caregiver contact field. When the extension is activated, a link called Volunteers can be found under quick links. Clicking this link will bring you to a page that lists all of your volunteers. Initially you may see no volunteers, because none have been added. To add a new volunteer, you can click the add new volunteer button. Fill in the volunteer contact information form and they will be added to the list. Additionally, if any of your rescuers are also volunteers you can select the Is Volunteer check-box and the they will also be added to the volunteer list. From the volunteer list, the name of the volunteer can be clicked to see the full Contact information for that volunteer. Their contact information can also be updated. Also from the volunteer list you can select the volunteers email address to send them an email from within Wildlife Rehabilitation MD. This extension currently does not provides users with an interface to connect to any existing volunteer databases used by your organization. In the future that capability will likely be added in but for now this is meant as a simple volunteer lookup database that integrates directly with the Husbandry Extension. Hope to See you at the NWRA Symposium!